As I’m sure you can tell, we love a good dip around here. 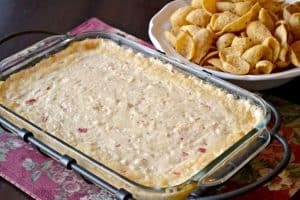 Here’s another dip for your next game day tailgate or holiday get-together. I combined parts of some of my favorites and think it turned out delicious! Combine softened cream cheese with the mayo and milk. Mix in the shredded chicken, red pepper, jalapeno pepper (if using), lemon juice, Frank's hot sauce, garlic powder, salt & pepper. Mix well and then add in shredded pepper-jack cheese. Place in a pyrex and bake in a 350 degree oven for about 30 - 35 minutes until hot and bubbly. I shared this dip on the The Country Cook, 4 Little Fergusons, Baking Bad, and Meet Penny on their Foodie Friday Link Up Party! Check them out for other great recipes!